Air conditioning not only heats or cools air but also reduces the moisture content, or humidity.Many modern vehicles utilise a permanent running compressor as part of its climate control system. Lack of maintenance of the system can cause costly repairs and vehicle breakdown. Most vehicle manufacturers recommend that your air conditioning system is serviced every two years. This will replenish the gas and oils used by the air conditioning system and will ensure all the components are working correctly. Conversion of old fashioned R12 systems to modern gases. If needed, we can also offer an extensive clean of your air conditioning system. This will remove any harmful bacteria that have built up in the system and on the vents. If your system has developed a fault, errors are being highlighted by the on board computer or its simply doesn’t seem right, we can undertake a thorough investigation to identify faults and then implement a solution. We are able to undertake Air Conditioning servicing and repairs on any vehicle up to 7.5 tonnes. 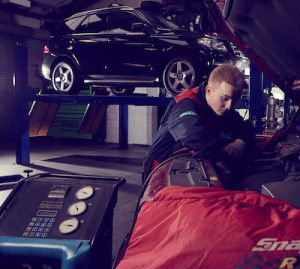 To ensure your air conditioning system is in peak condition, let Cross Motor Engineers test your vehicle next time you book your car in for an MOT or service.